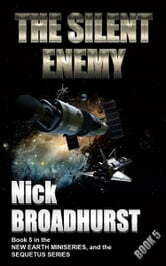 Here is also the fifth book in the New Earth Miniseries. This book turns down a totally new track, but so believable. To detail this further our main character, our extraterrestrial intelligence agent, has developed new abilities, having returned from the Pleiades to Earth. He can do now what he could only once dream of doing. However, the funny thing is, he says all dream of being able to do these things, and all can. Mostly, we just do not know it. He has developed telepathic abilities, telekinesis and extraordinary wisdom. He starts a personal following, to not only make his corporations big, but his name and self as well. The media love him. He is right out there now. They do not know his background, or where he is from. He is just fantastically successful and wise. This does draw out the enemy he seeks. Quickly, there are assassination plots to kill him. Some almost succeed. Where does he come from? People are now asking. What are his corporations that are sprawling all over the planet, in a matter of a decade? Does he need to be cut down? Are those who run this planet, losing control? It is the late 1990s, and time is moving on.